Home » Blog » Cost of Portable Generators: How Much Should You Pay? How Much Should You Expect To Pay For A Generator? What Are the Running Costs of a Portable Generator? How Much Does It Cost to Install a Portable Generator as a Home Backup Solution? How Much Should You Spend on a Portable Generator? Portable generators are the most popular type of generator because they give you the best value for your money. They are less expensive than a standby generator, yet more versatile. So how much should you budget in for a portable generator? Well, this depends on how much power you need and which practical features you want installed. 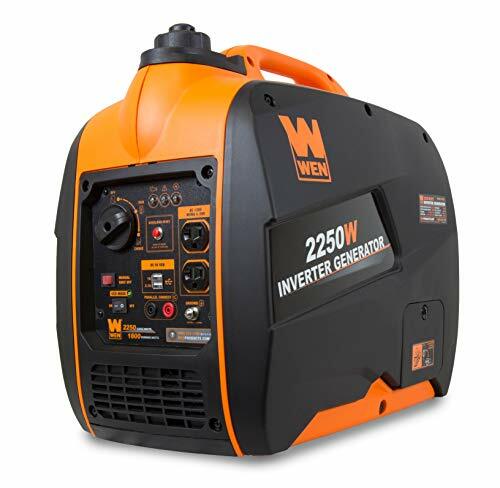 There are a wide variety of portable generators available; from low power solar powered portable generators to heavy-duty high power portable generators. There is a portable generator fit for every purpose and budget. Here is a simple overview of the costs of purchasing a portable generator, having it installed and maintenance and running costs. Most portable generators range somewhere between $300 – $6000. Yes, this is a wide range and it all has to do with the wattage, brand and technical features of the model. Expect to spend more on portable generators with more power, an electrical start, certain fuel types and monitoring systems like a fuel gauge or maintenance reminder. Smaller portable generators, around 2000 watts with a pull start, tend to be on the lower end of the price range. The more power, the more expensive the portable generator is likely to be. You can purchase a less than 2000 watt hand-carry portable generator for around $300. Medium-sized generators with a cart design and around 3000 – 4000 watts can cost somewhere between $500 – $800. Larger portable generators of 5000 watts or more will cost around a thousand dollars or more. In comparison, a stationary home standby generator of 20,000 watts costs at least $5000 but can reach double that. There are three ways a (fuel-powered) generator can start; a pull start, push start or electrical start and with a wireless remote key. A pull start is a basic element of fuel-powered portable generators and is often the cheaper option. The more advanced and more expensive portable generator designs might have a wireless remote key. These let you start the generator from a distance, usually up to 80 feet. Many portable generators have both a pull start and an electrical start. In case it doesn’t have a push start yet, you can have one installed when the generator is fitted with a battery. Another major influence on the price of the generator is the type of fuel or other energy source it uses. A portable generator running on gasoline is the most common and cheaper option but there are also generators that can run on liquid propane, an oil/gasoline mix, diesel or even solar power. Solar-powered portable generators are surprisingly affordable since they are similar in price to the low power gasoline run portable generators. However, solar power portable generators are very powerful with 2000 watts being the upper limit. Portable generators that run on liquid propane are also similarly priced to gasoline-powered generators. This makes it a safer yet still affordable alternative to the hazardous gasoline portable generators. Portable generators that run on natural gas are similarly priced or only slightly more expensive that gasoline-powered models. However, there are extra installation costs for hooking it up to the building’s gas supply. Diesel-powered portable generators are the most expensive. However, a generator running on diesel is more energy efficient so might still be the more affordable option in the long run. Some models are hybrids meaning that they are able to run on more than one kind of fuel. These models are also more expensive. The brand name of the portable generator also has some influence on the price. Considering there are many hazards associated with portable generators, this is not a department you want to skimp on, though. It is always safer to go for a qualified and trusted generator manufacturer. There are a few extra features that make the use and maintenance of a portable generator easier. Examples are a fuel gauge, a maintenance reminder, automatic low fuel shutoff and a parallel connection. None of these extra features are mandatory but they do make running the generator easier. Recommended features are a fuel gauge and a low fuel shutoff. A fuel gauge shows you how much fuel is still inside the tank. This is important information to have while running and also serves as a reminder to store fuel in case of emergencies. A low fuel shutoff automatically turns off the generator when fuel is running low. This prevents damage to the generator itself but also to all the electronics connected to the generator’s electricity supply. The running costs of a portable generator are affected by two factors. These two factors are its maintenance but more importantly the type of fuel it uses. Portable generators require the least maintenance, especially compared to a home standby generator. There are differences in level of maintenance between fuel-powered generators but for most models it is quite simple. For fuel-powered portable generators most of the maintenance has to do with the fuel tank. A portable generator running on diesel or gasoline requires occasional oil changes, for example. Other than that, portable generators are quite low maintenance. Just remember to run the generator every month or so to make sure that everything is still working as it should. Also have a specialized technician check the portable generator and perform routine maintenance every year. The labor costs are around $50 an hour. Most good quality portable generators have a warranty of 1 – 5 years. Depending on the warranty this may or may not include the costs of any necessary spare parts. Most of the running costs are associated with the type of fuel the generator runs on and how energy efficient it is. Another aspect to consider is how readily available the fuel is in your area which can also add costs. Gasoline is usually the most readily available type of fuel and is generally reasonably affordable and energy efficient. However, the price of gasoline is subject to fluctuations and difficult to store, especially in cold weather conditions. Liquid propane is also a difficult fuel to store but a more affordable option than gasoline. It is cheaper to buy per gallon and also more fuel-efficient. Portable generators hooked up to a home’s natural gas supply will always have fuel. How affordable this option is depends on the natural gas prices in your specific area. Diesel-powered portable generators have the advantage of being both cheaper to purchase than gasoline and being more fuel-efficient. However, it is also difficult to store. The cheapest portable generators to run are solar-powered generators. Solar energy is free, after all and these models also have a rechargeable battery that can be plugged directly into a wall outlet. Portable generators can be installed as a backup generator for houses. They are not as powerful as a stationary home standby generator but they can run the essential appliances during an emergency. They are easier and so more affordable to install than a home standby generator, but there are still a few installation costs associated, such as installing a transfer switch, possibly connecting to a fuel source and preparing the spot where the generator will run. A transfer switch is quite costly to purchase and install but it is an essential for the safe running of a portable generator. Transfer switch prices are around $400 – $1200 with an additional $200 – $500 in total for labor costs in installing it. Hooking up a portable generator to a home’s natural gas supply has different installation costs. The labor costs are generally lower than with a transfer switch because making the connection is easier. Final installation costs are for setting up the running site of the portable generator. A portable generator must be placed outdoors, at least 15 feet away from any buildings and on stable ground. Portable generators are not waterproof so they can’t be placed on soil, gravel or grass. The best foundation for a portable generator is a raised concrete platform. If you don’t have a suitable foundation for the portable generator then you need to add the costs of materials and labor for making one. In total, you are looking at around $1000 installation costs, including the materials and labor costs. Expect to spend more when you need to build a concrete foundation or connect the generator to a natural gas supply. This is really a personal choice but finding a generator that meets its purpose is essential. Don’t try to cut costs on essential features because you’ll likely end up with a generator that cannot do its assigned job. There is no point in shelling out cash for 10,000 watt heavy duty portable generator when you will only use it occasionally on camping trips. Likewise, a small hand carried generator is unlikely to house enough power to keep your home electronics running. Average costs for purchasing and installing a portable generator are around $2000 in total. This gives you a good quality and medium power portable generator with the installation costs and extra materials. Of course, you don’t have any installation costs for a portable generator that you will carry around on RV road trips and camping trips. In this case you only need to take into account the price of the generator itself and its running costs. A portable generator is for most people the most affordable and logical option between generator types. The purchasing price and installation costs of a portable generator are lower compared to buying and installing a home standby generator. To illustrate, the costs of a home standby generator including the installation will run you around $15000. This is over 10 times the cost of a small hand-carry portable generator and over 3 times the cost of installing a portable generator as a home backup generator. A home standby generator is only necessary when power outages are a frequent occurrence where you live. Then having a 20,000 watt generator is useful because it lets you run all home appliances like the air conditioning, washer, television etc. If power outages are rare then a portable generator is the more economical option, even with the installation and running costs. You can also control the running costs further by only connecting the essential electrical appliances like the lights, stove, water pump, water heater, central heating and refrigerator/freezer. Aside from costs, a portable generator is also more flexible. A portable generator can be taken to other sites, on road trips and to a new house while a home standby generator is a permanent fixture. There are four types of costs associated with a portable generator; purchasing cost, installation, maintenance and running costs. The biggest cost lies in buying the generator itself which is in turn influenced by the generator’s energy source. Installation costs are subjective to the situation. There might be no installation costs at all for the outdoor use portable generators while a home backup generator has higher costs. Maintenance costs are minimal with portable generators, far lower than the maintenance costs of a home standby generator. The running costs of portable generator depends mainly on the type of fuel and how energy efficient it is. This is the cost variable where you have the most control so think the options through slowly. General costs for a portable generator to be used for outdoor purposes are around $500 – $1000. Setting up a portable generator as a home backup generator will cost more or less double that amount.